MOUNT GILEAD — Randy VanTilburg of the engineering consulting firm Mannik & Smith Group spoke to Morrow County Commissioners and several Ohio EPA officials at the commissioners’ March 12 meeting. VanTilburg discussed several possibilities for sewer systems for Iberia. VanTilburg and the company are in contract with the county to study and make plans for a sewer system in Iberia due to the poor and failing conditions of the individual sewer systems in the village. VanTilburg is the consultant who recently worked with the county in setting up Johnsville and Chesterville sewer systems. VanTilburg said that EPA officials had identified four areas needing sewer systems in the northern part of Morrow County and they named Iberia as the priority in moving forward. He went on to compare the new “decentralized” sewer system like the one in Christiansburg, Ohio, in Champaign County with those in Johnsville and Chesterville. “We looked at cost for a 20-year investment and then also look at what the local people want,” he said. There are approximately 104 residential homes in Iberia as well as industry, businesses, farm buildings, churches and fields. VanTilburg said they looked at pumping to three or four regional sewer systems and then considered a “STEP” system for the village. With the “STEP” system, homes and businesses would have a tank and small diameter pipelines would carry treated waste from the tanks to a local treatment system. Paul Vandermeer, Ohio EPA Surface Water Inspector for the area, brought up the need to consider maintenance needs and maintenance costs for any system. He noted that construction of tanks is critical to avoid leakage. VanTilburg said that in the “STEP” or decentralized system, the most maintenance is pumping and maintaining pumps. For the traditional gravity system, there is more maintenance at the treatment plant. County Commissioner Warren Davis suggested calling to ask how older systems are holding up. VanTilburg recommended that the commissioners and others who are interested or involved could visit Christiansburg to see how their system with about 500 residents is operating after three years. It began operating in 2014 and has the decentralized STEP system. Morrow County Economic Development Director Shane Farnsworth said his office is evaluating the cost of various systems and researching what grant funds are available. The Development Office plans to do income surveys of residents in Iberia. This will help determine how the county is able to compete for grants to help pay for a new sewer system. “We will need a good number of surveys returned and plan to do visits and outreach like we did to get the sidewalk grant in Marengo,” Farnsworth said. Farnsworth said the more grant money they are able to get, the lower people’s monthly sewer bills would be. Randy VanTilburg presents an option for a sewer system in Iberia to Morrow County Commissioners. 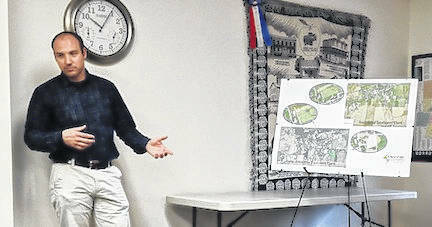 https://www.galioninquirer.com/wp-content/uploads/sites/38/2018/04/web1_IMG_20180307_100455-2-.jpgRandy VanTilburg presents an option for a sewer system in Iberia to Morrow County Commissioners.